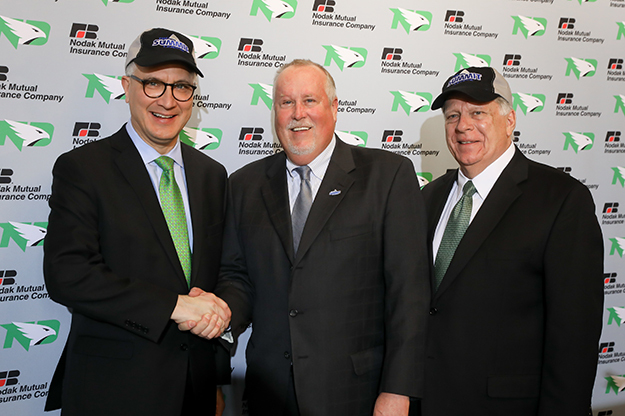 UND President Mark Kennedy (left), Summit League Commissioner Tom Douple and UND Athletic Director Brian Faison celebrate UND’s acceptance into the Summit League for most sports and the Missouri Valley Football Conference in football. Photo by Shawna Schill. 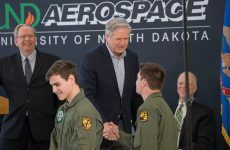 When the official announcement was made at a Thursday afternoon presser that the University of North Dakota would be changing its conference affiliations in all sports except men’s and women’s hockey, everyone realized it was a seismic shift in the school’s athletic landscape. However, apart from the conference directors, University officials and coaches assembled at the podium, few in the room were thinking about the academics side of it all. But it was the academics that UND President Mark Kennedy referenced first as he led off the announcement. Kennedy said he had listened to a number of UND coaches lamenting the challenging travel schedules that came with life in the Big Sky Conference, which spans three time zones from the Central Plains to the Rockies to the Pacific Coast. The coaches weren’t thinking of themselves; it was the academic well-being of their team members that concerned them. So when Kennedy announced that 15 of its athletic programs, including men’s and women’s basketball and volleyball, would be leaving the Big Sky in 2018 and joining the Summit League, and that UND’s football team also would be vacating the Big Sky in 2020 for the Missouri Valley Football Conference, the president relayed a discussion he once had with UND head volleyball coach Mark Pryor. Not known as one to complain, Pryor described the challenges of life in the Big Sky, rife with early-morning flights, long layovers and lonely bus rides into remote settings. “He told me what a big struggle that was for our student athletes when it comes to academics,” said Kennedy, while an assembled panel of coaches, including Pryor, looked on and nodded in agreement. UND will join many of its old rivals, including NDSU, SDSU and USD, on a regular basis in athletics starting as early as 2018 in most sports. UND football will join the same rivals in the Missouri Valley Football Conference in 2020. Graphic courtesy of UND Athletics. 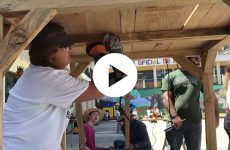 With these moves, UND is joining conferences filled with teams that are much closer to home, including North Dakota State in Fargo, South Dakota State University (SDSU) in Brookings and the University of South Dakota (USD) in Vermillion. Long plane trips and sometime longer airport layovers can be replaced with simple bus commutes to regional rivals and other teams in the same time zone. It gives UND student athletes more time to hit the books when they’re not competing on the field or the court. “Anytime you have a situation like this that helps student athletes, you have to be clearly satisfied,” said Travis Brewster, head coach of the UND women’s basketball team that has feasted on both Big Sky and Summit League completion over the past several years. Brewster joined Pryor and UND head football coach Kyle “Bubba” Schweigert at the conference-change announcement on Thursday. Pryor and Schweigert are coming off Big Sky Conference championships for their respective teams in 2016, and Brewster is in position to secure another Big Sky Conference championship this year. 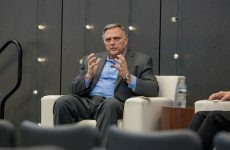 Tom Douple, commissioner of the Summit League and a former athletic director at Southern Utah University of the Big Sky, knows well the challenges UND currently faces with academics and travel budgets. 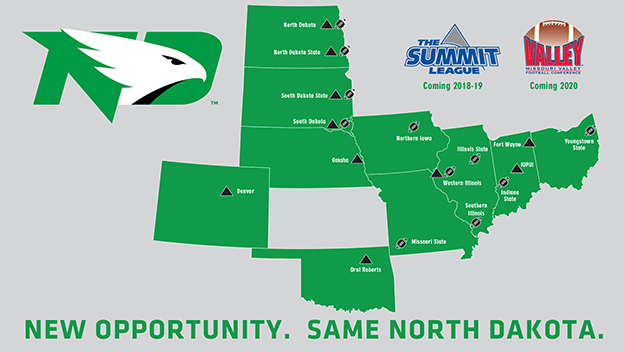 Douple said that the Summit League may not have the beautiful mountains and Pacific Coast locations that UND athletic teams have become accustomed to in the Big Sky, but what they lose on destination places, they gain on the academic side. Douple said the Summit has already started planning adjustments so that each team has a “travel partner” that accommodates scheduling with other conference teams in sports such as basketball and volleyball. The league also will work toward a schedule that routinizes games on Thursdays and Saturdays. Currently the Summit League’s schedules are not as regular as a result of having an odd number of teams with nine. The setup will allow UND and its conference partner to travel to locations and play two conference mates near each other over the course of a weekend (Thursday-Saturday). It would work the same when teams traveled to UND and its travel partner to play. Under the plan going forward, UND would partner with NDSU. UND enjoyed this kind of setup in the Big Sky, though its travel partner has been the University of Northern Colorado in Greely, some 900 miles away. Besides the academics of its student athletes, UND anticipates other benefits. By playing more traditional regional rivals, it also will gain revenue from more fan interest and more butts in seats at games. More revenue from fan interest coupled with decreased travel budgets are important factors moving forward as UND continues to grapple with budget cuts to all areas of the campus to meet reduced funding mandates from the State Legislature. Two of UND’s highest-attended home football games in the last four years, for instance, were against USD in 2016 and South Dakota State in 2013. Both are longtime rivals of UND, and both have fan bases that travel well, bringing an economic punch to the places they visit. UND would reunite with both programs in the Summit League and the Missouri Valley Football Conference. As for UND coaches, they’re just eager to get some old-fashioned rivalries heated up again. Pryor, whose volleyball team already is a top-15 program nationally for attendance and is coming off a Big Sky championship and trip to the NCAA tournament, is looking forward to even bigger crowds — home and away — and success in the Summit League. He ended his portion of Thursday’s news conference by dropping a playful warning to UND’s future Summit League mates.